The United States Congress designated the Chumash Wilderness (map) in 1992 and it now has a total of 37,794 acres. All of this wilderness is located in California and is managed by the Forest Service. The terrain of Chumash Wilderness drops toward the southwest from Mt Pinos, 8831 elevation, (the highest peak on the Los Padres NF). 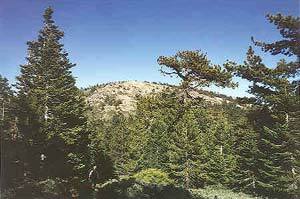 Conifers populate the higher elevations of the Wilderness and lead down to fire prone chaparral which dominates the lower elevations of the southern California mountain ranges. Barren, knifelike ridges stand between steep-walled drainages, and you'll find some of the highest and most rugged terrain in all of southern California in the Chumash Wilderness of the Los Padres National Forest. Planning to Visit the Chumash Wilderness? How to follow the seven standard Leave No Trace principles differs in different parts of the country (desert vs. Rocky Mountains). Click on any of the principles listed below to learn more about how they apply in the Chumash Wilderness.